Keith Johnston, 41 from Tyne and Wear was permanently paralysed in this horrific crash, after saving money by fitting his Renault Scenic with part-worn tyres. Temperatures were well below freezing on 8th February as he was driving four friends on a road near Carlisle. Attempting to negitiate a bend he lost control of the car, bumped across the road and rolled down a ditch. 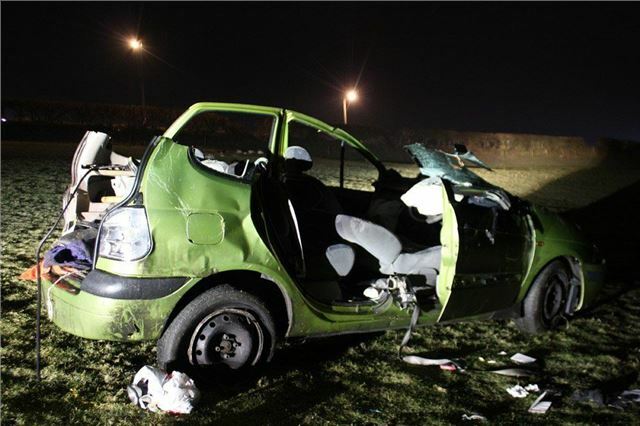 Very fortunately his four passengers all escaped uninjured. A police investigation blamed four part-worn tyres as a major contributor to the crash. Though the rear pair had only been fitted a few months previously, they were already down to an illegal tread depth. Keith had always bought part worn tyres and replaced them every few months, unaware of the safety risks of buying used tyres. Keith said, “I thought I was saving money with part-worn tyres but I’ve paid a terrible price. If I knew then what I know now, I would never have bought part-worn tyres." Keith has spent six months undergoing intensive rehabilitation in hospital but is hoping to return home soon where he will be dependent on 24 hour care. His plight is highlighted as TyreSafe, the UK’s leading tyre safety organisation, recently revealed the alarming findings of a investigation it carried out with Auto Express magazine into part-worn tyres. Fifty part-worn tyres were inspected by an independent expert who found that 98% had been sold with illegal tread depth. More than a third of the tyres were found to contain additional dangerous damage. One tyre contained a metal object penetrating 5cm through the tread. Other serious safety breaches included dangerous and unsafe repairs, exposed cords, bead damage and evidence of carcass damage. Stuart Jackson, chairman, TyreSafe: “All tyres suffer from wear over time but TyreSafe always advocates the fitting of brand new tyres as the safest option." For further information about tyre safety and part worn tyres, visit www.tyresafe.org. "One tyre contained a metal object penetrating 5cm through the tread." Maybe this is a typo? I will assume it was 0.5mm, as 5mm would have gone into the air chamber. I've run on a tyre with a 0.5mm metal object (a screw) in the tread many times, as my tyres used to pick these up in my work environment. Buying part-worn tyres is always going to be a risk, but so is driving anyway. Buyer beware, but a reputable dealer will not sell faulty part-worn tyres. This smells of an industry troll! Sorry, but no he was not "paralysed by part worn tyres". He was paralysed by driving in below freezing conditions, losing control of the car and having tyres with no tread on them. The fact that they were originally part worn doesn't seem very relevant - they had worn out, they could have been bought new and still have worn out. Psrt worn tyres may or may not be a good idea but that doesn't change the fact that this is an advert masquarading as a badly written factually incorrect article. This is very sad, but also very odd. Surely if he'd bought brand new tyres and let them wear to an illegal condition he'd have had the same loss of control and subsequent injury. We're all driving around on 'part-worn' tyres and we must maintain them so they are legal and, more importantly, safe - ie 1.6mm is the legal minimal but only a fool would wait until then to change them. Best changed at 2.5 to 3mm.... anything else is false economy. Equally important is to ensure no damage and no bulges and pressures are correct... Again, very sad story, but the part worn tyres are not to blame!